Quietly orbiting Earth since March, the U.S. Air Force's second X-37B space plane will surpass its 270-day design life Wednesday with no sign the clandestine spacecraft is landing any time soon. The X-37B has been in orbit since March 5, when an Atlas 5 rocket hauled the two-ton, 29-foot-long spacecraft into space from Cape Canaveral, Fla.
"On-orbit experimentation is continuing," said Air Force Maj. Tracy Bunko, an spokesperson for the Secretary of the Air Force. "Though we cannot predict when that will be complete, we are learning new things about the vehicle every day, which makes the mission a very dynamic process." The winged spaceship's specific mission is secret, as is the contents of the craft's unpressurized cargo hold. But the Air Force says its purpose is to haul experiments and other small payloads to space and return them intact. It's circling 210 miles overhead moving at more than 17,000 mph, but the stubby-winged spaceship is designed to glide back to Earth guided by GPS navigation signals and touch down precisely on a runway in California. Air Force officials said the X-37 was designed to fly in space for up to 270 days, but engineers will extend the mission beyond its nine-month baseline. "We initially planned for a 9-month mission, but will continue to extend it as circumstances allow," Bunko said in a statement released to Spaceflight Now. "This will provide us with additional experimentation opportunities and allow us to extract the maximum value out of the mission." With wings, tail stabilizers and cargo bay doors, the reusable X-37B resembles a space shuttle orbiter. It's about a quarter of the size of an orbiter, and its thermal blankets and heat shield tiles give the craft a checkered black, gray and white color. But the space plane's tiles are tougher than the shuttle's, its electromechanical flight control system replaces the orbiter's hydraulic actuators, and the X-37B is powered by a deployable solar panel instead of cryogenic fuel cells. 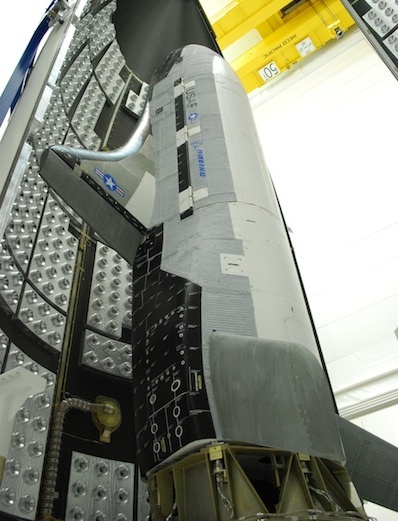 The upgrades allow the X-37B to stay in orbit months longer than the space shuttle, which was limited to missions lasting about two-and-a-half weeks, according to Air Force officials. 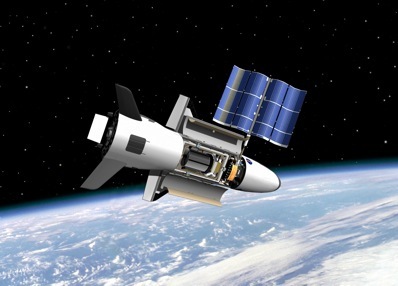 The X-37B is also called the Orbital Test Vehicle. The Air Force says it will not announce the return date until landing nears. The military revealed the first X-37 mission's homecoming a day before it flew to a successful landing at Vandenberg Air Force Base, Calif. When engineers decide to end the mission, the X-37 will fire a thruster to drop from orbit and plunge back into the atmosphere. The space plane will be shielded from scorching temperatures by ceramic tiles as it soars over the Pacific Ocean, and its guidance computer will autonomously hone in on 15,000-foot runway at Vandenberg. The inaugural X-37 orbital mission, which ended last Dec. 3 after 224 days in space, accomplished the first U.S. automatic landing from space on a runway. The Soviet Union's Buran space shuttle achieved the feat in 1988. Built by Boeing Co., the X-37 space plane started off as a NASA project. The Defense Department took over in 2004, and responsibility for the X-37 ended up with the Air Force in late 2006. 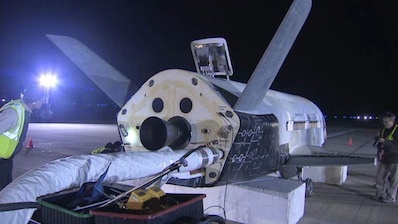 Boeing built two space-worthy X-37s. Before approving plans to launch the current mission, engineers inspected the first craft after its return last year. Last year's flight demonstrated the craft could operate in space and successfully return. Going into this year's mission, officials said they would further explore the craft's capabilities, including a longer stay in orbit and accepting worse weather conditions for landing. For now, the Air Force plans to maintain silence on the progress of the current mission. "We won't have anything else to say until we announce a landing date, which has not yet been determined," Bunko said. Ted Molczan, a respected satellite tracker based in Canada, said the ongoing mission has maintained its orbit between 200 miles and 215 miles in altitude since launch. Last year's flight conducted more orbit adjustments, possibly to test the craft's propulsion system. Managed by the Air Force Rapid Capabilities Office, headquartered in the Pentagon, the Orbital Test Vehicle program tentatively plans a third flight in the future. But the Air Force will not release a date for the next mission. Lt. Col. Tom McIntyre, the X-37 program director, said more information on another flight could be released by the end of the year.